The presidential car which was reported stolen has finally been found in Tororo Uganda, just 10 kilometres from Malaba border with Kenya. The vehicle was reportedly recovered on the side of the road in the Ugandan town just two days after it was reported missing. Now investigators think that the driver who claimed to had been carjacked was an accomplice in the robbery. It is said that the robbers brandished 3 almost new AK-47 rifles which makes the police rule out robbery incident. 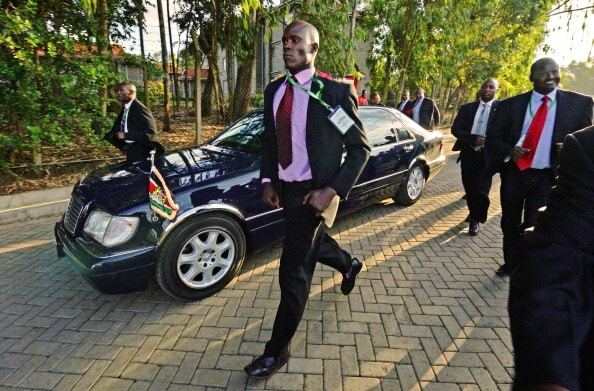 The official driver of the President Dan Machui was also carrying around Ksh 60,000 which was also taken away from him. Investigators believe that the money might have been used to facilitate the quick shipment of the vehicle from the country into Uganda. The car, a maroon BMW 735 with decoy registration KAW 479Y (official is GK A374E) was frequently used by President Kibaki as his official backup car. It was acquired in 2000 when President Moi was almost exiting power. Former President Kibaki’s PA, Alfred Gitonga used to drive the car around with most of his friends identifying the car with him. It is believed that he had great love for the 7-series BMW as it was custom made for the comfort of the people it was intended to serve. Some of the Special Crimes Prevention Unit officers believe that Mr Gitonga might have played part in the robbery. They have not found evidence to link him to the crime but they believe that the people who snatched the car from the driver are police officers with links to people who are either currently or formerly worked with the Presidency. Robbery of heavy luxury cars like BMW 7-series or Mercedes Benz S-class is almost non-existent in the country with most robbers focusing on versatile 4x4s, small Toyota saloons or lorries ferrying goods upcountry or to neighbouring countries. The carjacking of the luxury BMW is raising a lot of questions within the police, intelligence and presidential protection circles. The theft has brought lots of blame game in the Presidential protection circles with senior officers blaming Machui for being careless and always hanging around in social circles in high end cars from State House.